Britain continues to play its role as a world power as David Cameron follows in the footsteps of Tony Blair, working for peace in the Middle East. Before he was given the job of “peace envoy” Blair set the bar rather high by helping start two wars in the region. David Cameron recently went on a trip to the trouble spot, promoting democracy by selling British weapons to anybody with a cheque book and an oil well. Meanwhile the Labour Party have become bankrupt. They are £23 million in the red. The shadow cabinet have promised to get Saturday jobs to help repay the overdraft. The party have reverted to their former status of being bankrolled by the trade unions, who recently gave them £2.2 million. The Tories banked £11.4 million from companies in the City, and the Lib-dems received a £5.99 voucher for Boots the chemists and a £3.00 W. H. Smiths book token, from one of Nick Clegg’s neighbours. 2011 is a UK National Census year. The last UK census, ten years ago, revealed that almost half a million Brits had entered their religion as Jedi, and a considerable amount claimed to be witches. Church leaders have objected to Jedis and witches being classed as religions, but the government, worried about becoming victims of black magic and the power of the Force, said they are powerless to do anything about it. Readers will be pleased to know that the nation’s obsession with Health and Safety continues unabated. A woman from Cheshire was recently awarded thousands of pounds in damages after attending an event organised by the Health and Safety Executive and falling down an open drain. The 2012 London Olympics draw nearer, and to emphasise their commitment to sexual equality and political correctness, the organisers have decided the first event will be women’s football, which will be held two days before the opening event in a different country (Wales). There have been complaints about the ticket prices for some events. Some tickets will be on sale for over £2000, which is almost as expensive as a train ticket from London to Manchester. Beach volleyball, originally planned to take place in Brighton, has had the venue changed to Horse Guards Parade, after organisers discovered that there was no beach in the south coast resort, and the scarcity of heterosexuals in the town could adversely affect ticket sales. 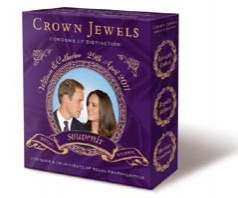 Three individually wrapped condoms are presented in a “timeless souvenir heirloom collector’s box” which includes a full colour “collectable portrait of the Royal Couple as they might appear on their wedding day”. They are “lavishly lubed” and “regally ribbed”. A pinch, or a stretch, or a squeeze at £5.00 a box. So if you want to practice royalty-inspired birth control, maybe a picture of Charles and Camilla on the bedside table will be more effective.